When I first started blogging here, one of the things I intended to do was to keep track of where I found mentions of knitting in literature. I even have a special category of posts just for this. Perhaps I’ve been knitting more than I’ve been reading because I haven’t really found many… until now. Thursday (the book’s heroine) is returning to her fictional residence inside the story of a book. N.B. Pickwick is a dodo. It felt as much like home as it had ever done. I kicked off my shoes and flopped on the sofa next to Gran, who had fallen asleep over a sock she was knitting. It was already a good twelve feet long, because, she said, ‘she had yet to build up enough courage to turn the heel’. I closed my eyes for a moment and fell fast asleep without the nagging fear of Aornis, and it was nearly ten when I awoke. But I didn’t wake naturally – Pickwick was tugging at the corner of my dress. ‘Not now, Pickers,’ I mumbled sleepily, trying to turn over and nearly impaling myself on a knitting needle. Doesn’t she realize that turning the heel is the best bit? I do recommend Jasper Fforde’s writing. Start with The Eyre Affair to read the beginning of Thursday’s chronicles. If you like reading literature and are not averse to fantasy, I’m sure you’ll enjoy them. In my last post at the end of Blog Week, I mentioned that one of my plans for the next year is to end up with less yarn in the stash. In order to do that, I need a baseline to work from. I spent an afternoon with my Ravelry stash, bringing it up to date, and I have some figures to play with. Incidentally, did you know you can download a spreadsheet of your stash? Just press the excel logo on the top right of the stash page. It is difficult to know whether it will be more appropriate to look at the stash in terms of length or weight, so I have both here. Obviously, using a thick yarn up will have a greater impact on the weight, rather than the yardage and using a thin yarn will have the opposite effect. In total, in my stash, I have 8.67 kg of yarn, which comes out as 15 miles, 68 chains, 18 yards and 6 inches. (I do like the imperial system for measurements of length, although for small weights I prefer metric – see bottom of post for a little reminder of how it works). Of this total, a little over half (4.5kg; 8m 48ch 17yds) has been designated for a particular project and a fair proportion of this (1.9kg; 1m 78ch 17yds) is attached to projects that I have already started. Just over a fifth of my stash consists of leftovers (most of which is sock leftovers that I am working through gradually and incorporating them into my mitred square scarf). 2.87kg (4m 55ch) of my stash is not yet allocated to any project. So there we have it. I’ll go through my stash next year again and see what the difference is. My knitting this month is consistently square. As well as continuing with the mitred square scarf, I’ve revived the 2011 KAL blanket that I’m doing in some cotton from Texere Yarns. I can’t remember what made me shelve it in the first place and I’m quite enjoying it. 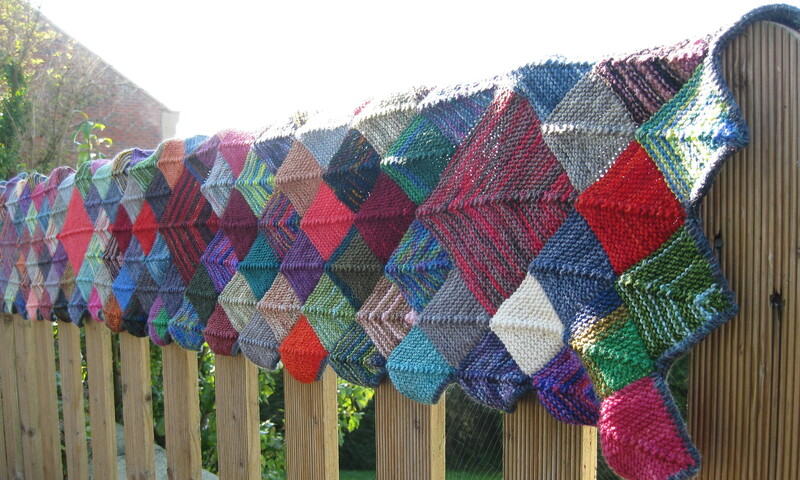 The group used the patterns from a KAL on bernat.com for the first square each month, then added a second, optional, square from a variety of sources. I had both squares for January and February and part of the first March square when I stopped. I have now finished the first March square, started the second one and added another couple of inches to the January square to make it, well… square. When first knitting it, I was a little optimistic about how far it would stretch! I was very chuffed to discover that I had won a contest this week. I entered the Sanday Spinners blog week competition and was the only correct entry. I’m looking forward to receiving my carbon fibre needles in a few days.